One year ago, smoke covered the finish line of the Boston Marathon in a tragic terrorist attack that will never be forgotten. The Boston bombings killed three people and left more than 260 people injured, with hearts in Boston and all over the nation torn as well. One year later, and our nation was reminded once again how strong it can be. On the eve of the marathon, the Boston Red Sox – who always have a “Boston Strong 617” jersey hanging in the dugout – had a wild comeback victory over the Baltimore Orioles at Fenway Park. The next day, the marathon was here and an American won the male division for the first time since 1983. Meb Keflezighi won the 26.2 mile marathon that begins on Hopkinton and ends on Boylston Street in Boston’s Back Bay, with a time of 2 hours, 8 minutes, 37 seconds. The time was a personal best for Meb. He defeated Kenya’s Wilson Chebet by 11 seconds. All this week, articles of remembrance have been written on last year’s bombings and the victims, video montages have been made, and pictures have been posted all across social media. The Red Sox lost on the day of the marathon, but they were still ‘Boston Strong’ and it felt as if even Derek Jeter was hoping for a Sox win from a David Ortiz home run. Just two weeks shy of his 39th birthday, Keflezighi showed his remembrance of the victims from last year by writing them on his bib. He took a risky approach to the race, as a man much older than many of his competitors. Instead of being cautious, running with the pack and then taking over at the end to take the race, Meb took a much more aggressive way to run the marathon. He took the road of getting ahead and running physically and emotionally exhausted by yourself, with nobody around. In one of the most physically grueling sports, you ache, your mind is wandering and the pack feels like they are right on your heels ready to hunt you down no matter how far away they are. Chebet closed the gap several times, and came close to taking the lead on the final two miles, but he could never get out front. On the final stretch of the race, Meb realized the title was his and a smile stretched to his ears and nearly up to his bald head. 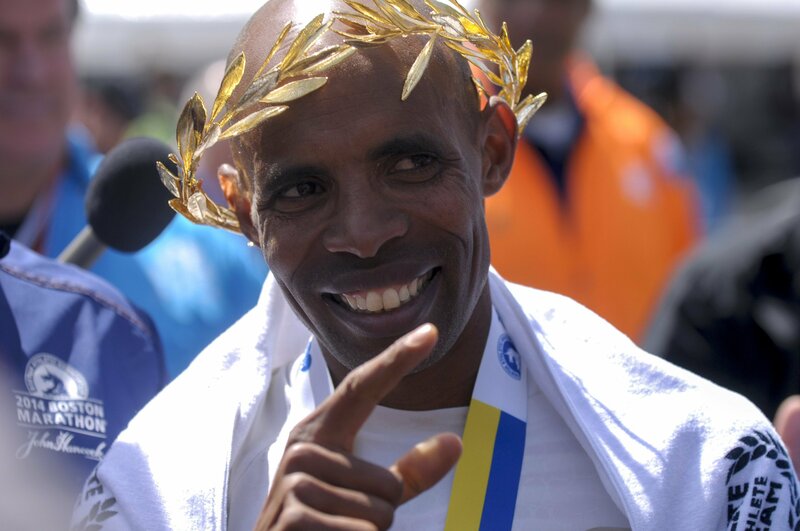 Meb raised his sunglasses to his head, pumped his right fist to the crowd and made the sign of the cross over his heart before he crossed the tape. He then opened his arms as wide as he could and embraced the blue tape as a champion. When he crossed the finish line, the American flag was draped over Keflizighi as tears rolled down his face. This is not Meb’s first time breaking an American drought in his running career. In 2012, he won the New York City Marathon, becoming the first American to do so in 27 years. Earlier in 2004, he won a silver medal in the Olympics, which was the first time the feat was done since 1976. The storied career of the runner almost came to an end when he contemplated retirement after the New York City Marathon. Four years after Greg Meyer, the last male American to win the iconic marathon, Meb fled his birth country of Eritrea, then a 12-year-old boy immigrating to America. When the bombs went off near the finish line of the marathon last year, Meb was near the horrible act and the sound reminded him of his childhood. This year, all Meb could hear at the finish line was cheers of joy for him, and then “The Star-Spangled Banner” played for his victory. 32,408 runners started the race with the events of last year on the minds of each and everyone of them. The champion was one of those with last year’s victims on his mind, no matter where he originally came from. Meb was not born here, and his family chose to immigrate to America. He cannot run for president, but he can run for freedom and the American dream. That’s exactly what he did. After running for over two hours of grueling pain, Meb ran faster than he ever had before where we saw so much tragedy last year and so much triumph this year. One year after the Boston bombings, an American from Eritrea represented our nation in the greatest way possible. You run through pain and adversity as hard as you can, until your arms grab ahold of freedom. That’s the American dream, and that was Meb’s dream when he came to the land of the free.